MechRunner is taking the very popular third person action game setting and adding some nice looking mechs. Sounds good to use so let us take a look at it. At heart you pilot a massive mech fighting through a war-zone. Enemies of various types swarm around you and either attempt to blast or smash you. Levels also have massive bosses with their own attacks. On your end you have a large amount of different weapons including swords and scythes. 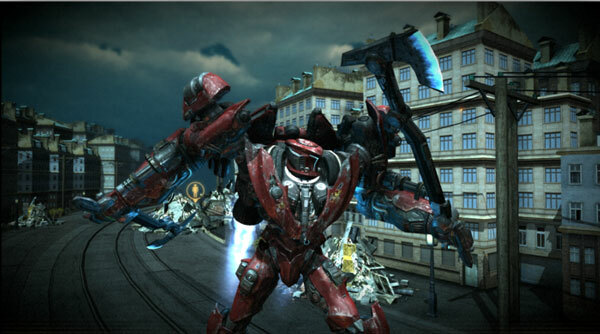 It also has the transforming modes you’ve come to expect from games like this. Perhaps the part of the game which is most interesting is the melee system. You have highly upgradable weapons to use after disabling an enemy. This lets you do some interesting slice-and-dice tactics much like in Metal Gear Rising. We think this will set it apart from the many other games like this. Around 1908 a mysterious object from space crash landed on earth. The KGB gathered information about this advanced tech and used it to advance the game world far beyond our own. Now the Russian O.S.O. is taking over the world and only a rogue engineer from their team can help stop them. With the information from rogue engineer Jesper Teterev managed to put together the XP-41. You are there to pilot the incredibly powerful weapon against legions of enemies who have similar advanced weaponry. You can take a look at their Kickstarter project here. Most of the unlocks on this one are wallpapers, unlocks and copies of the game. Only the highest levels will get you sessions with the developer team or design input. This game is being produced by Spark Plug Games who are probably best known in these gaming circles for Puzzle Quest 2. Draw your own conclusions about where the game is going from their previous work. I’m on the fence about this one. The combat, especially the melee feels slow. There’s a distinct lack of fluidity I’m detecting in the video. It reminds me of the armored core melee system but less fluid. Granted the melee option for armored core was quite weak. The deflection of bullets with the melee would definitely make it more a viable strategy. From a gameplay standpoint, I’d probably be blasted to bits before being able to get up and close. i do like the slice and dice tactic but I’m not sure if that would a key component of the gaming experience. it probably depends on ammo conservation. More video will be needed of course to fully demonstrate the melee system.